Acute promyelocytic leukemia(APL) is characterized by the t(15;17) chromosomal translocation leading to the formation of the PML-RARα oncoprotein. This leukemia has attracted considerable interest in recent years, being the first in which therapies that specifically target the underlying molecular lesion, i.e., all-trans retinoic acid (ATRA) and arsenic trioxide (ATO), leading to induction of differentiation and apoptosis have been successfully used in clinical practice. The advent of ATRA therapy has transformed APL from being a disease with a poor outlook to one of the most prognostically favorable subsets of acute myeloid leukemia. Further improvements in outcome may be achieved with the use of ATO, which achieves high rates of remission in the relatively small proportion of patients now relapsing following standard first-line therapy with ATRA and anthracycline-based chemotherapy. Moreover, recent studies have suggested that ATO and ATRA, or even ATO alone, used as front-line treatment of PML-RARA- associated APL can induce long-term remissions. This raises the possibility that some patients can be cured using differentiation therapies alone, without the need for chemotherapy, thereby potentially reducing treatment-related toxicity. 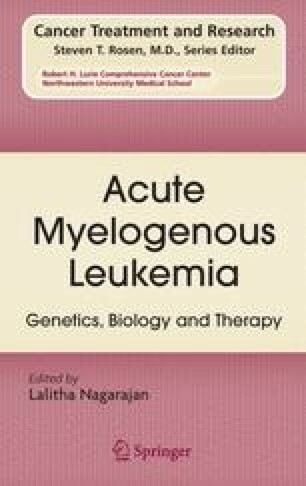 It is clear that the success of such an approach is critically dependent upon molecular diagnostics and monitoring for minimal residual disease (MRD) to distinguish those patients who can potentially be cured with differentiation therapy from those requiring additional myelosuppressive agents. This represents an exciting new phase in the treatment of acute leukemia, highlighting the potential of molecularly targeted and MRD-directed therapies to achieve an individualized approach to patient management. DG and FG gratefully acknowledge grant support from the Leukaemia Research Fund of Great Britain. DG is also supported by the European LeukemiaNet.